Today's profile is of 2012 Stevie winner Brooke Denihan Barrett of Denihan Hospitality Group. 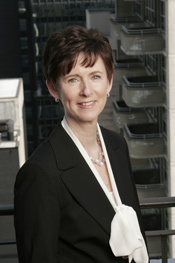 Brooke Denihan Barrett is co-CEO of Denihan Hospitality Group, along with her brother and co-CEO Patrick Denihan. With offices in New York and San Francisco, the firm is a nationally recognized, independent owner and operator of boutique hotels in top U.S. urban markets. Denihan Barrett focuses on daily operational responsibilities at Denihan, which involves leading the company and spearheading its expansion plans. Mentoring up-and-coming employees and advocating for the advancement of women in the hospitality industry are also initiatives extremely important to Denihan Barrett and the company, and were complimented by her recent Stevie Award win. Denihan Barrett has made a point of participating in a variety of events and panels to inspire and motivate the industry’s next generation of leaders. After winning a Stevie Award, Denihan Barrett noticed a direct uptick in interest in both her personal endeavors as well as in the operations at Denihan. Not only did colleagues and friends reach out to congratulate her, but there were also many emails and phone calls from hotel owners, vendors and potential industry partners. The Stevie Award win significantly helped broaden Denihan Barrett's overall awareness. Winning the Stevie Award has provided Denihan Hospitality Group with incredible feedback from colleagues, friends and longtime acquaintances. The award has had a very positive effect on the company, helping it to garner much attention from new owners, investors and developers. It has been a great motivator for the firm's 2,000+ member team and continues to enhance the organization’s credibility as a leading owner/operator of boutique hotels. The entry deadline for the 2013 edition of the Stevie Awards for Women in Business is August 28. Complete entry details are available at www.StevieAwards.com/Women.